UCLA study analyzed the Latino community between 1980 and 2010. Despite the fast growth ethnic in the United States, the Latino community is facing a significant challenge in the medical field. Since 1980, its population has risen 243 percent from under 15 million to over 51 million in 2010. The number of Latino physicians per 100,000 Latinos has declined by 22 percent during that period (from 135 to 105). Meanwhile, the national rate of non-Hispanic white physicians increased from 211 for every 100,000 non-Hispanic whites to 315 per 100,000, according to a study conducted by UCLA's Center for the Study of Latino Health and Culture. The study used data from U.S. Census from 1980 through 2010 in five states with large Latino populations — California, Florida, Illinois, New York and Texas. According to Dr. Gloria Sanchez, the paper’s lead author, the shortage could negatively affect health care for U.S. Latinos. “For example, there is a shortage of healthcare professionals that, at minimum, have the language skills to communicate effectively with patients, provide quality care and avoid harmful outcomes for a growing majority of patients not only in California but in the nation as a whole,” said Sanchez in an interview to UCLA Newsroom. To access the study click HERE. You can get more information about the study in this link.
" Urgency" is not the reason why most of the people choose urgent care. A study by BMC Health Services Research shows that inappropriate use of urgent care for non-urgent patients is a "growing problem with significant economic and healthcare consequences". The purpose of this study was to determine the motivation behind, and characteristics of, adult patients who choose to access health care in our urgent care clinic. A total of 1, 006 patients were randomly surveyed. According to the study, approximately 50% were Hispanic, and over 20% of adults presenting for care spoke only Spanish, while 25% of patients identified Spanish as their preferred language. 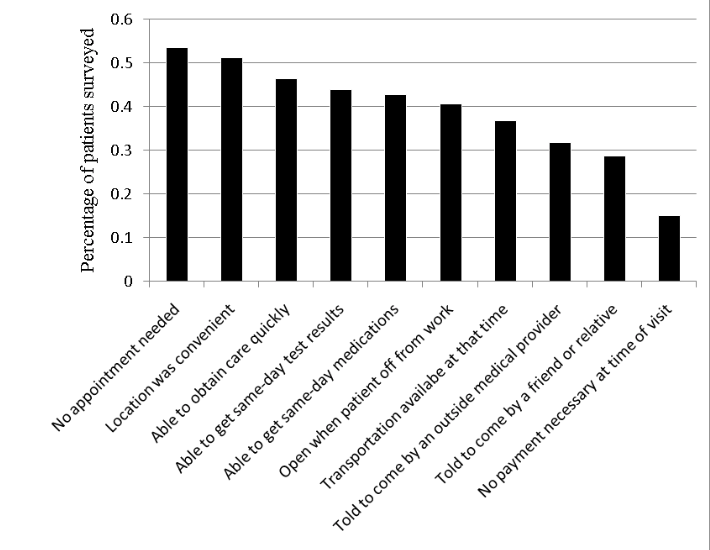 Despite a common belief that patients seek care in the urgent care setting primarily for economic reasons, this study suggests that patients choose the urgent care setting based largely on convenience and more timely care. This information is especially applicable to the potential increase in urgent care volume in a universal healthcare system. Check the complete study here. Plus, the relation between English proficiency and healthcare outcomes. You can read the entire study in this link. Bill Tan arrived in America when he was 15 years old. He knew just 500 words of English, but this was 500 more than his anyone else in his family. The experience inspired him to found Transcendent Endeavors, a company that uses technology to break down communication barriers.